Many people can benefit from eating a low-fat, healthy menu. While fat isn't all bad, too much of the wrong types of fat can be detrimental to your health. Choosing low-fat foods and snacks, however, can make a big difference in your health. MyPlate.gov recommends eating no more than 30 percent of your calories from fats and oils. The following recommendations for low-fat menus are based on the MyPlate suggested 2,000 calories per day. A low-fat menu is one that has less than about 25 percent of your calories from fats. Based on a 2,000 calorie per day diet, this is about 500 calories or less of fat per day. Since fat has 9 calories per gram, 500 calories is about 55 grams of fat per day. 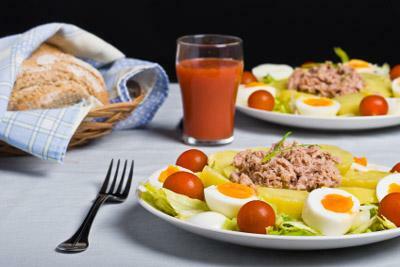 Divided among three meals and two snacks, low-fat meals should have about 12 to 15 grams of fat per meal with two snacks of about two to five grams of fat each. Meals in the following menu have fewer than 25 percent of calories from fat. Choose one of each meal and two snacks every day. If you need help downloading the printable menu plan, check out these helpful tips. Simmer oats in water with a little cinnamon. Soak chia seeds in milk for about 10 minutes. Pour into a blender and add remaining ingredients. 354 2 g 5 % 25 g 88 g Combine all ingredients in a blender, scraping down sides frequently. Blend until smooth. 1 ounce baked tortilla chips 420 11 g 23% 35 g 102 g For vegetarian, substitute 3 ounces chopped low-fat tofu for chicken and non-fat soy yogurt for non-fat yogurt. Spread on a whole wheat tortilla. For vegan/vegetarian, replace with 2 ounces of tempeh. Toss jicama, carrot, scallions, and ginger. Place over turkey and wrap tortilla. Whisk together lime juice, cumin, salt, and pepper and set aside. Mix dressing and salad together just before eating. 360 7 g 12 % 28 g 45 g There are healthy choices at restaurants. Stick with grilled sandwiches made from white meat poultry, pile on the veggies, leave off the mayo and cheese, and have fruit or a salad without dressing for a side. Toss vegetables and fruit and top with dressing. Serve on top of sliced pork tenderloin. Broil or grill hamburger patty to minimize fat. Toast bun and spread with spread. Top with veggies and burger. Choose two to three low-fat snacks each day. The best snacks are raw fruits and veggies, but when you want something more, consider some of the following low-fat snacks. The above meals are just a starting point for healthy, low-fat eating. When planning your own meals, consider the following. Fat occurs naturally in many foods, including grains, fruits, and vegetables. Minimize added fats from oils and other fatty substances like butter. If you eat dairy, choose fat-free varieties. Dairy products can be confusing to many. For example, two percent milk doesn't mean two percent of the calories come from fat. Instead, it indicates that the milk is two percent fat by volume. Instead, approximately 35 percent of calories in two percent milk come from fat. If you eat meat, trim all visible fat before cooking to minimize fat content. Remove skin from poultry and select white meat cuts, which are lower in fat. Game meats like venison are excellent low-fat alternatives to beef. Nuts and seeds can be part of a healthy, low-fat diet. However, because of the high fat content of nuts and seeds, limit them to an ounce or less per day. Many low-fat processed foods use chemicals to replace fat. Instead of snacking on processed foods that are labeled "low-fat" or "fat-free," stick with whole natural foods like fruits, vegetables, and healthy whole grains. Choose dry heat cooking methods for meats, and allow the fat to drip away from the meats. For example, when broiling, place the meat on a rack over a pan so fat drips into the pan. Other dry heat cooking methods that minimize fat content include grilling and roasting. Avoid high-fat cooking methods such as deep frying or pan frying. Ask the server about low-fat options. Ask for sauces on the side, and then use them very sparingly. Choose grilled, broiled or roasted lean meats. Ask for your food to be prepared without butter or oil. Choose fish, which is typically lower in fat. Ask for salad dressings on the side. When ordering salad, leave off high-fat items like bacon, cheese, and eggs. Ask for a "to go" box when your meal comes. Apportion half of your entree. If you order a meat-based entree, save half for later and then stick with vegetable sides. Ask for them to be prepared without butter or oil and with sauces on the side. Choose a baked potato instead of mashed potatoes and leave off toppings. Ask about fresh fruit for dessert. Consider ordering a low-fat appetizer and a salad instead of an entree. Leave mayonnaise, which is high in fat, off sandwiches. Choosing a low-fat lifestyle is an excellent way to care for your health. By making smart choices and planning meals and snacks, you'll be well on your way to low-fat living.